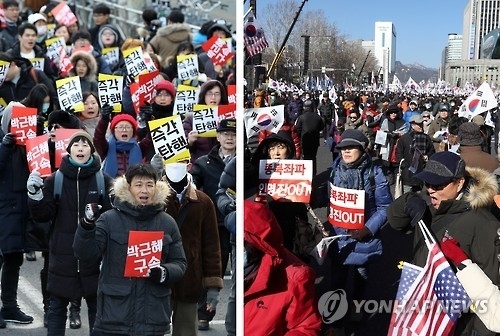 SEOUL, Feb. 11 (Yonhap) -- South Koreans took to the streets Saturday calling for impeached President Park Geun-hye's resignation and demanding an extension of special prosecutors' probe into a presidential scandal. 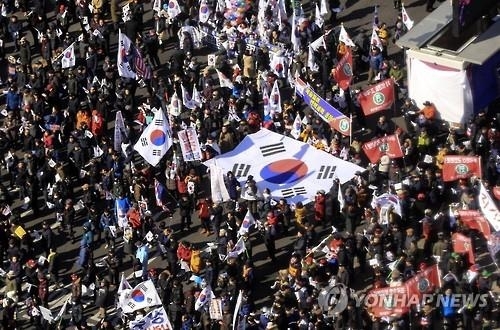 To counter the anti-Park rally, the president's supporters, marked by their waving of the Korean flag, held their own protest, demanding that Park's impeachment be nullified. Braving cold weather, hundreds of thousands of protesters held their 15th weekly candlelight vigil in central Seoul, calling for the Constitutional Court to speed up its review over the legality of Park's impeachment. The rally's organizer put the turnout at an estimated 750,000. The anti-Park protest came amid growing calls for extending the February deadline for a probe led by Independent Counsel Park Young-soo into the corruption scandal involving Park and her long-time friend. The investigation can be extended once by a month with consent from Prime Minister Hwang Kyo-ahn who serves as acting president, but Hwang remains lukewarm toward the extension despite calls from opposition parties. "Park's supporters are expecting that the impeachment would be nullified if the special probe ends this month and acting Chief Justice Lee Jung-mi retires next month," said Kim Kyung-ja, a vice chairperson of the Korean Confederation of Trade Unions. "We should be more united to make our voices heard for Park's ouster." The court has until early June to decide whether to unseat or reinstate the president following parliament's vote in December to impeach Park over the scandal. It earlier indicated its resolve to finalize the proceedings before March 13, the retirement date of the acting chief justice Lee as her departure will create another vacancy in the nine-member bench. Chief Justice Park Han-chul retired last month, dropping the bench down to eight members. Meanwhile, Park's supporters demanded that the top court reject Park's impeachment and dissolve the special prosecutor team. Many protesters, wearing thick parkas and gloves to fight off the cold, waved the Korean and U.S. flags, chanting slogans such as "nullify the impeachment," "break up the parliament" and "dissolve the special prosecutor team." 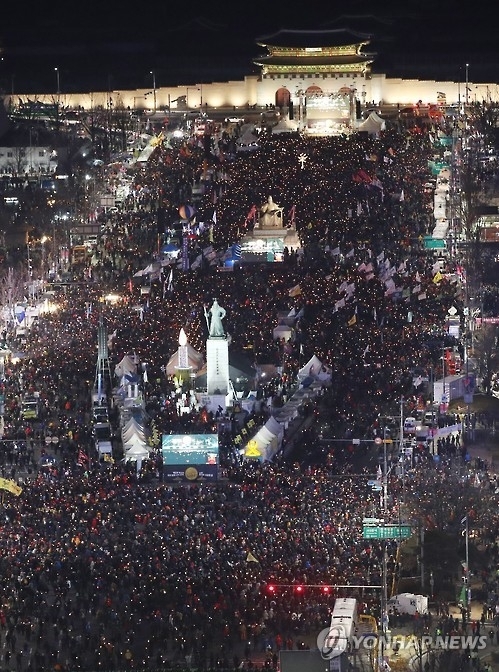 "The candlelight vigil has become a political, party-oriented, Democratic Party event," Chung Kwang-young, a member of "Parksamo," a fan club of the president that had staunchly supported Park and other conservative groups. Presidential hopefuls also attended rallies both for and against Park. Moon Jae-in, a former leader of the main opposition Democratic Party who has maintained a comfortable lead in recent polls, joined the rally against Park At Gwanghwamun Plaza, a main venue for the rally in Seoul. "People gathered together again as they want Park to immediately be unseated," Moon said, calling for the top court to quickly approve the impeachment. An Hee-jung, a provincial governor and the runner-up in recent polls, took part in the anti-Park rally held in Gwangju, some 329 kilometers southwest of the capital. Lee Jae-myung, mayor of Seongnam city and a declared presidential hopeful, joined the pro-impeachment rally in Seoul. But Ahn Cheol-soo, a former chair of the minor opposition People's Party, did not attend the rally, expressing his opposition to pressing the court into finalizing the review. Meanwhile, the ruling Saenuri Party's Rhee In-je, a former lawmaker of six terms now running for the party's presidential candidacy, joined the pro-Park rally "to be part of the patriotic people's wave," his aides said. The minor conservative Bareun Party, however, expressed a cautious attitude toward joining either rally, saying its job was to impeach the president and the rest should be left to the court.